In September 1755 the most famous Indian in the world was killed in the Bloody Morning Scout that launched the Battle of Lake George. His name was Henderick Peters Theyanooguin in English, but he was widely known as King Hendrick. In an unfortunate twist of linguistic and historical fate, he shared the same first name as another famous Native American, Hendrick Tejonihokarawa, who although about 30 years his senior, was also famous in his own right. He was one of the “Four Indian Kings” who became a sensation in London in 1710, meet Queen Anne, and was wined and dined as an international celebrity. Both Hendricks were Mohawk warriors. Both were Christians who aided Great Britain against France in their struggles for empire. 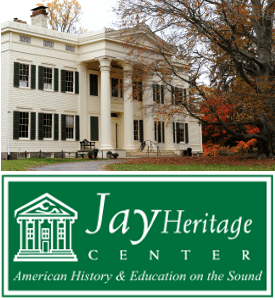 Both served as important sachems who stressed cooperation instead of bloody confrontation and who helped negotiate the relationship between their fellow Mohawks and European colonials who recognized that the Iroquois Confederacy was critical to the balance of power in early 18th century America. Both Hendricks, were later confused by historians into one man. Eric Hinderaker’s The Two Hendricks: Unraveling a Mohawk Mystery sets out to unearth the lives of these two important Mohawk men and untangle their stories from a confused history of colonial Native American relations. 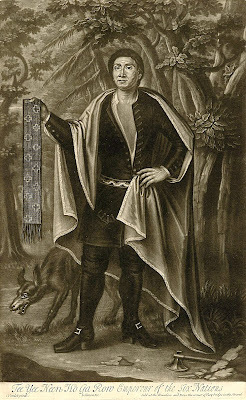 King Hendrick (1692-1755), whose death in battle and burial place are memorialized in almost forgotten ground along the highway between Glens Falls and Lake George Village, was already famous at the time of the Bloody Morning Scout (the same attack that claimed the life of Ephraim Williams, founder of Williams College). The year before he died he gave an important speech at the Albany Congress of 1754. His death during the French and Indian War in the cause of British Empire however, propelled his fame and ships and taverns were named in his honor abroad. The earlier Hendrick (c.1660-c.1735) took part in King Williams War, including the failed attempt to launch an all-out invasion of Canada in retaliation for Frontiac’s raid in February 1690 which destroyed Schenectady. He was among the Mohawks of Tiononderoge (the Lower Castle), who were swindled out of their lands along the Mohawk by their colonial neighbors. Part of the value of The Two Hendricks, however, lies not only in its untangling of the two men, but also in coming to grips with the ways in which the swindling often worked both ways. Hendrick, a common Dutch name equivalent to Henry, was just one part of their names, but Mohawk names comprise the other part. Hinderaker demonstrates that both Hendricks gave as well as they got in building alliances, fame, and power that left them among the most famous Native Americans in history. Photo Above: Henderick Peters Theyanooguin (King Hendrick), wearing the English coat he wore on public occasions and his distinctive facial tattoo. 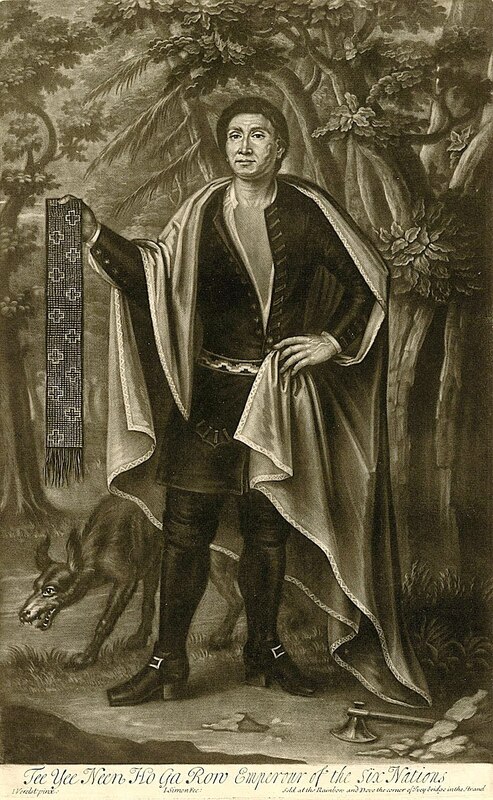 This print published just after his death and titled “The brave old Hendrick, the great Sachem or Chief of the Mohawk Indians” is considered the most accurate likeness of the man. 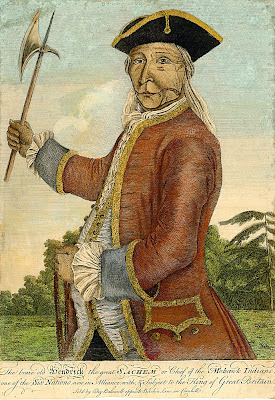 Photo Below: Hendrick Tejonihokarawa, one of the “Four Indian Kings” who traveled to London in 1710 The print, by John Verelst, is entitled “Tee Yee Neen Ho Ga Row, Emperor of the Six Nations.” The title “Emperor” was a bit of a stretch, he belonged to the council of the Mohawk tribe, but not to that of the Iroquois Confederacy as a whole. One of the Hendricks is a member of the so-called Four Indian Kings, who are iconic in Canadian history. There is more information on the Four Indian Kings at Canada’s Got Treasures, which is also a space where you can share your images/thoughts. I’m confused. Dean R. Snow’s work and Barbara Silversten’s genealogy states that the King Hendricks called Hendricks Peters was NOT THEYANOGUIN but TEJONIHOKARAWA b. abt. 1660 and member of the Wolf Clan making the trip to England in 1710 with the other “Kings”. Hendrick THEYANOGUIN was a member of the Bear Clan and b. abt. 1692 and is the King Hendrick that was killed in 1755 in the Lake George Battle. Anonymous. 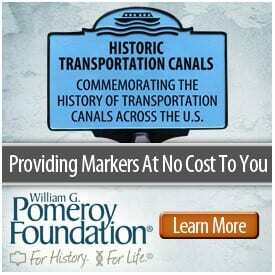 Both men were known as Hendrick Peters. Dean Snow says Theyanoguin was born in 1692 and died in 1755. Tejonihokarawa traveled to London in 1710. That’s what is says here as well – or am I missing something? I am descended from Hendrick Theyanoguin through his son Daniel who married Mary Barrett. Hendrick was born in 1692 and died at the battle of Lake George in 1755. There is some confusion as to how he died but the consensus is that his horse was shot out from under him and a soldier bayoneted him.